Cast say goodbye to ‘The Musketeers’. BBC One drama The Musketeers is to end with the third and final series, it has been confirmed. The news may not come as too much of a surprise to fans who have been wondering when the third series – which consists of ten episodes and usually airs Dec/Jan – will air following its commission in February 2015. Executive producer Jessica Pope said, “Season 3 of The Musketeers completes this 30-hour series with ambition and energy. It is packed with action and adventure, fun and drama from the very first opening seconds of episode one to the very end. Pasqualino said: “My Musketeers adventure was truly an incredible experience, which will live with me forever. I had the most amazing time exploring this beautiful world with even more beautiful people. Burke said the final series will explore “a universe that is less stable than the first two”. 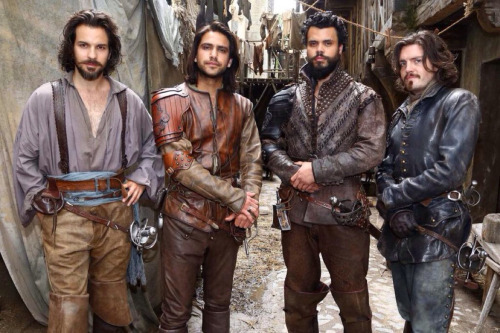 Cabrera commented: “Three seasons of The Musketeers was a true, action packed adventure, in every sense of the term. I will miss the world of Dumas, these rich characters, and many of the friendships made along the way. Charles added: “The Musketeers has been a truly wonderful experience, an enlightening challenge and a memorable three seasons. The final series sees the addition of Rupert Everett as the corrupt Governor of Paris. Returning characters include, Alexandra Dowling, Ryan Gage, Tamla Kari, Hugo Speer and Maimie McCoy. The Musketeers will return to BBC One later this year.